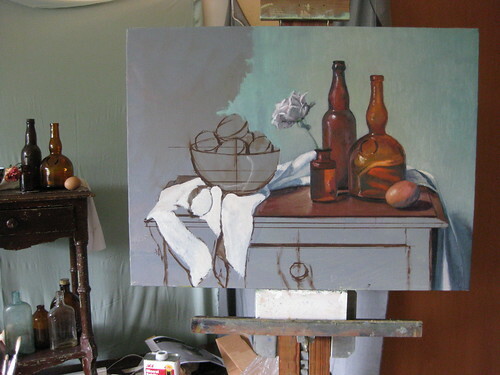 I am still working on paintings that will be unveiled later, keeping my busy and happy :) However I miss sharing new work with you, so here is a partially complete still life that has been on hold for the past three weeks. This mid-point phase is a good example of the new method I have been using, it entails working on specific areas of a painting and refining to a certain level before moving on to a new adjacent area. I plan on finishing the initial lay in of the painting and then go over it again, refining and adding greater detail and depth to the painting. A fellow classmate of mine asserts that for a painting to really gain the luminous quality that only oil paint can provide it must be worked on a minimum of three different times where the paint has had an opportunity to dry between each session. I have been chewing on that idea a lot over the past few weeks, and have come to agree with her. 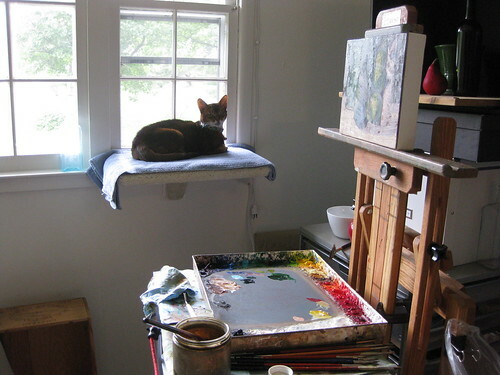 Because there is something special that happens when you come back to a painting after a break, apply a fine layer of linseed oil to bring out the color and then lay in new paint. The painting begins to glow. I also think that the mind continues to ponder and work on the idea of the painting, so the subject matter becomes understood to a greater extent, and I feel the emotional harmony that first inspired me is more able to be translated into the painting.